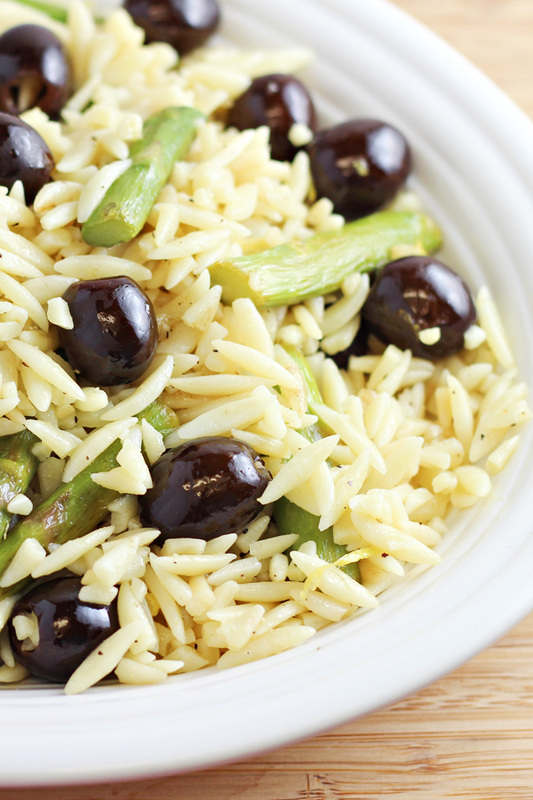 This Orzo with Black Olives and Asparagus recipe is an easy side dish with just 5 simple ingredients and only a few steps. It’s a perfect companion to your favorite spring meals. Disclosure: I was provided with Lindsay olives for this recipe. 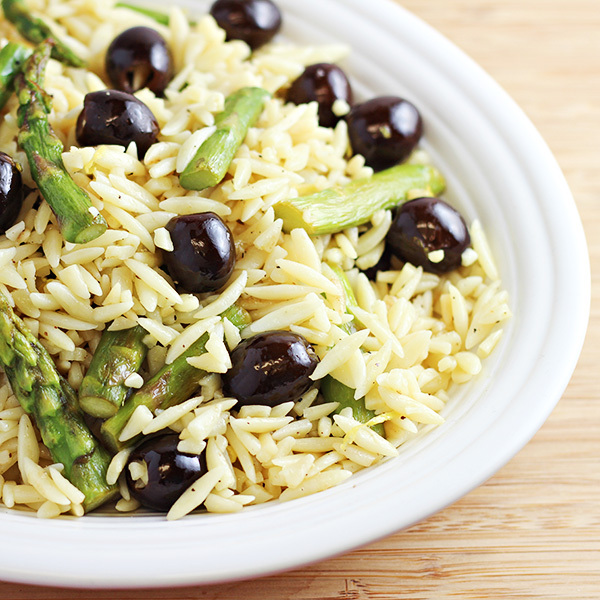 The star of this Orzo with Black Olives and Asparagus recipe is the olives. Olives have long been one of my favorite foods and something I grew up eating. One of my younger siblings couldn’t pronounce “olives”, so they were called “labids” — which really doesn’t sound like “olives” at all, but the name stuck around. If I say “labids” to any of my siblings, they know exactly what I mean. 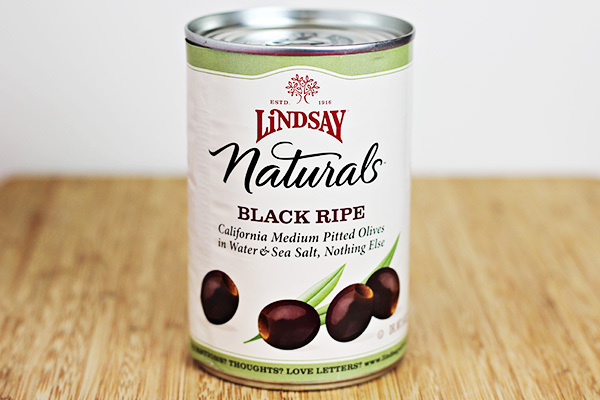 For this recipe, I used Lindsay Olives, which are my favorite brand of olives. Most of their varieties would work well in this recipe, but I’m a black olive lover and I absolutely love their Naturals Black Ripe Olives. Not only are they delicious, but I really love how they look. While they are black olives, the tone is more of a dark brown, earthy color. 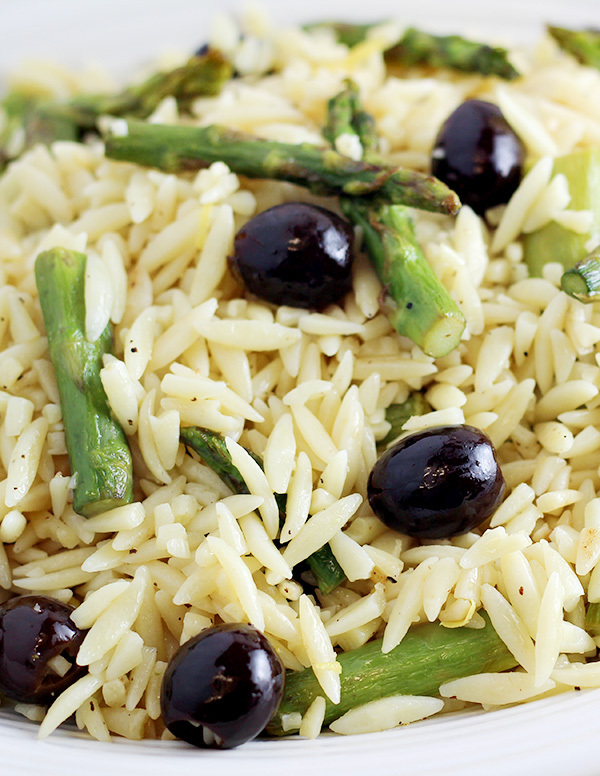 To make this Orzo with Black Olives and Asparagus recipe, you’ll start with your orzo. You will need to cook it according to the package instructions and drain it well. Trim the ends off of the asparagus and discard. The asparagus spears are then cut into thirds. In a pan, olive oil is heated and the asparagus pieces which are cooked until starting to become tender-crisp. The heat is turned off and the orzo is gently stirred into the asparagus. The beautiful Lindsay Naturals Olives are added next. The zest and juice of a large lemon are added and the orzo is seasoned with salt and pepper. Then it’s ready to be served. You can serve this warm, or it’s equally as good served cold. It even makes a great dish to take to potlucks or picnics because of how great it does taste when it’s room temperature. Here is the Orzo with Black Olives and Asparagus recipe which is ready for you to print or to save. Not ready to make it yet? Save it to one of your Pinterest boards so you can find it later. Zest the lemon and cut lemon in half. Cut asparagus spears into thirds. In a large skillet, heat olive oil over medium-high heat. Add asparagus and cook, stirring frequently, until tender-crisp and just barely beginning to brown. Turn off heat. Add the orzo to the skillet and gently toss until the orzo is combine with the asparagus and the orzo is coated with the olive oil. 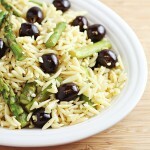 Add the olives and combine with orzo and the asparagus. Add the lemon zest and squeeze both halves of the lemon over the orzo mixture. Gently mix to combine. Season with salt and pepper to taste. Feel free to adjust the amount of asparagus. I usually use about 12 spears regardless if they are thin or thick, but you can adjust it to your personal preference. 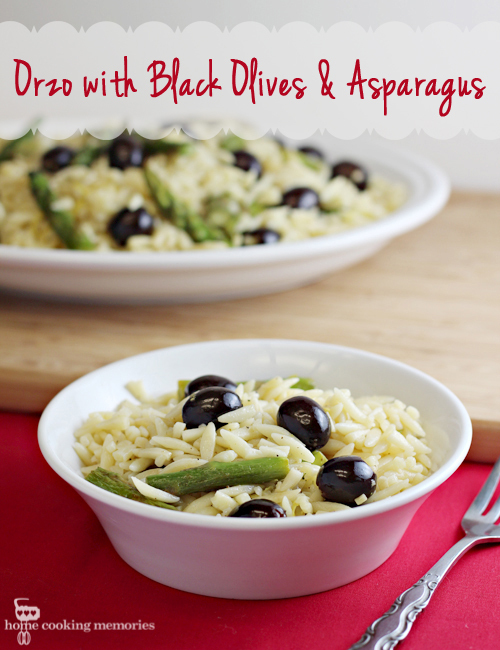 I’d love to know what’s your favorite way to use olives — leave me a comment and let me know! I love the combination of ingredients in this dish. Sounds so good! Thanks for sharing it. Sounds easy and delicious! Adding this to our Easter dinner. Thanks Brandie! I had featured u in the post of Top 7 Refreshing Side Dish with Asparagus on AllFreshRecipes, looking forward to ur renewly recipes! While I haven’t made it a day early, I do think it would work. We’ve had the leftovers the next day and they were just as good. Thanks Abbie! That’s how I felt…it was all the ingredients I love. Really good stuff! Love Lindsey Olives! I have never made orzo before. It looks amazing. Oh wow, this sound very unique and interesting! Hubby loves black olives, so I will have to try it out. You know I totally pinned this to make soon! Asparagus and black olives! Y U M! This looks delicious, I love olives too, have them as often as I can thank you for this recipe will have to try it soon. Beautiful dish! We used to put olives on our fingers as kids and call them gorilla fingers. 🙂 Such fond memories. Those natural olives look delicious!